Yesterday we saw a reliable media report that Michael Cohen’s cellphone was used near Prague around the time that the Trump-Russia dossier claims he was in Prague meeting with the Russians to arrange payment to election hackers. Then we saw Cohen once again deny that he had ever been anywhere near the city. So which of these things is true? Palmer Report laid out last night how both things could be true. Michael Cohen appeared to be the burner phone supplier for the Trump regime, so it’s entirely feasible that another member of Team Trump could have been in Prague, using a phone that was registered in Cohen’s name. But which team member? That brings us to a little research about a guy you may have heard of named Donald Trump Jr.
Donald Trump Jr speaks fluent Czech, by his own admission. His mother Ivana Trump was born in then-Czechoslovakia and went to college in Prague. 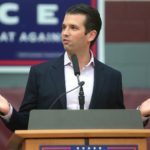 According to the New York Times, when Donald Trump Jr was young, he often visited his maternal grandfather, who lived just outside of Prague. Wait a minute here. Donald Trump’s son knows the Czech Republic, speaks the language, and has spent a lot of time just outside of Prague. European intel says that someone with a cellphone registered to Donald Trump’s fixer was just outside of Prague during the election, and was there to meet with the Russians in a collusion plot. This is the same Trump son who by his own admission met with the Russians at Trump Tower during the election in a collusion plot. Trump’s fixer, who has confessed to so many other crimes, says it wasn’t him – but he didn’t say no one went to Prague. It doesn’t take a lot of imagination to envision Donald Trump Jr going to Prague during the election to arrange hacker payoffs with the Russians, taking a Michael Cohen-supplied burner phone with him, and using that phone while staying in his grandfather’s home town just outside of Prague. It’s not as if we’re arbitrarily accusing him of anything; Junior already committed treason with the Russians in Trump Tower, and this would merely be a second similar instance.